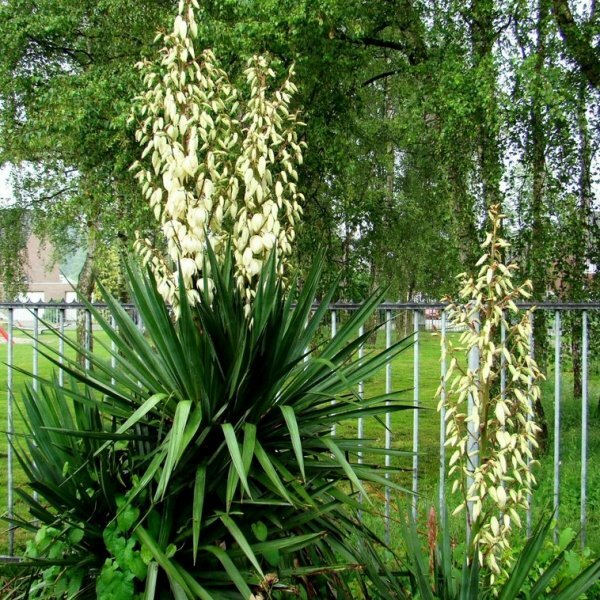 The landscape-worthy Adam's needle is certainly the most cultivated of all Yucca species. A widespread native of the eastern United States, it forms bold, dense clusters of long, sharp leaves that look super all season long. 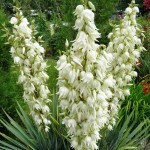 In the summer, large spikes of showy ivory flowers are produced. Wild plants are most commonly found growing in open, upland forests and prairies where the soil is often sandy. Adam’s needle forms large, spiky rosettes of long, sword-shaped leaves. These range in color from medium green to gray or blue-green. Mature clumps will form offsets to create slowly spreading colonies. Tall flower stalks are produced in late=spring to summer. These are lined with ivory, bell-shaped blooms that are fragrant and pollinated at night by yucca moths. 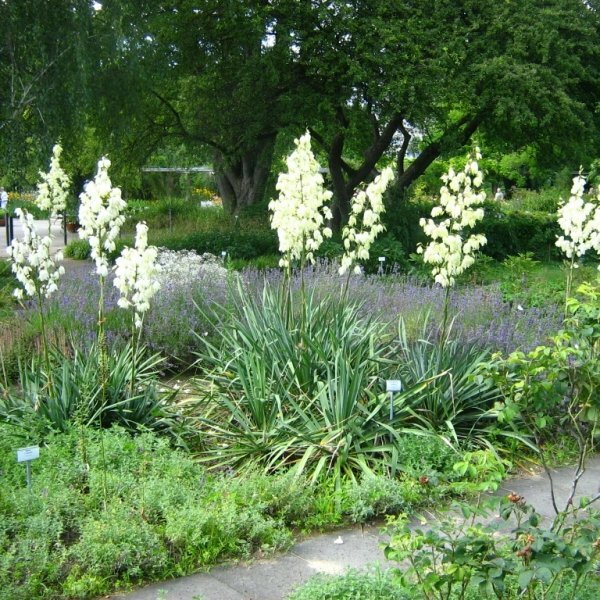 The blooms are followed by bulbous, green seed capsules that turn dry and dark brown when mature. Full sun and well-drained, average to poor, sandy loam are best for this resilient plant, and little care and maintenance are needed to keep it performing well. Established plants are tolerant of heat and harsh sun. Adam's needle looks great planted in masses in dry, sunny beds and borders, and its coarse, upright foliage is highly deer resistant. Germination 1. Place the seeds in a glass of water to soak for 24 hours. This softens the hard outer seed coat, making germination easier. Stratify in the refrigerator at +2-+4C for 21 days. It will increase the germination rate. Seeds can be un-stratified as described bellow, but the rate will be lower. <br /> 2. Fill peat pots with starting media. A superior starting media for yucca is a mixture of sand, peat and vermiculite, but any starting media will do.<br /> 3. Set the peat pots on a tray and moisten the soil with water. Pour off any water that collects in the tray.<br /> 4. Place a seed in the center of each peat pot and cover with 5-8 mm of soil.<br /> 5. Place the tray of peat pots inside a large plastic bag and seal the bag. Place the bag in an area with temperatures +25C.<br /> 6. Remove the bag when seedlings emerge. This usually takes one to two weeks but may take longer, so be patient.<br /> 7. Place the pots in a sunny window or under artificial lighting.<br /> 8. Transplant seedlings outdoors in spring when temperatures are above +16C.